pabbajita because he has done away with all his faults. of the Buddha’s day. They pursued a multitude of religious paths. 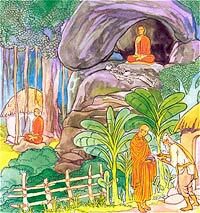 Here the Buddha explains who a real priest, monk or a brahmin is. because he gets rid of his impurities he is called a ‘pabbajita’. practising for eradication of moral defilements. the impurities of the household life to become a bhikkhu. female mosquitoes may produce up to 3,000 eggs during their lifetime. affect the population each year at an alarming rate. perfect breeding ground for these dreadful blood bandits. detrimental for certain conditions like pregnancy. Natural products are the best way to avoid mosquitoes. skin more often than those containing DEET. Use mosquito nets around bedding. Mosquitoes are most active at night, so protect yourself while you sleep. Repair window and door screens. Choose screens made from a finely-woven mesh. Mosquitoes are attracted to lights, so don’t turn the bright ones on too early. Fill tree holes with sand or mortar. remove or prevent stagnant water, mosquitoes will have to go elsewhere. invading your area - and your body. can purchase products made from citronella oil. bring them inside during winter months. on your location, best results are obtained via the method I described. plant (and get those into our greenhouse). no-see-ums from coming through the screen. was purchased this year to help my 2 kids from getting numerous bites. parts to make new plants. coconut drains very well and its pH neutral. sleeping on my porch lying under the shade of the citronella plants. with a slightly more bitter fragrance than lemon scented geraniums. scent alone is worth the effort. not repell, but it smells really good. Any advise? I saw an old decrepid plant, ready to give up, and took a little piece of it and plunked it in the ground. The thing grew like heck! I had to prune it so much, I finally gave it away. It grows too big in the ground. But, it can live with not too much water, it blooms all summer and never gets sick or bugged. If you have room for it, or the lust to prune several times a season, go ahead and plant it. lose leaves during this process either. let it dry out pretty good between waterings. delightful flavor to your sugar! Fire ants, when visiting Puerto Rico every winter, were AWFUL at times! bloomed, or are about to. pretty plants to beautify our deck. Summer, I did not get any blooms, just foilage. Come winter, they died. I will again buy four more to add to my deck this Spring/Summer again. oil as a child to repel mosquitoes so I was curious. for seafood smells if you put them in the kitchen a couple of days. new plants. A branch broke off so I stuck it in the pot and it took off. keep it potted. You can’t kill it…I’ve been trying for two years. lovely. I read that they are sometimes used as bonsai. I can see why. Winter. I am thrilled to finally find out about planting the cuttings. buy this plant to keep the mosquitos away, like I did. It won’t work. back door but it really doesn’t repel bugs at all. get rid of it. But I wouldn’t buy it again. install screens for their windows. front porch, will comment if and when I get results. the comments here. I will report on them later. in Singapore’s hot hot hot weather. I bought 2 small plants in spring of 2003 and planted them in a medium pot. plant was bought at 1 foot high; is now 5 feet and climbing. The plant has taken off so well, it’s 2 times the size it was in 4 weeks. I would buy more but can’t find them now. harder to find each year. also made the room smell great! afraid if I put it in the ground it would grow into a great big tree. repellent, or in cooking; it gives off a wonderful citrus flavor. Seed will not come true to the named cultivar, varying amounts of scent and leaf-shape will occur. plants actually repel mosquitoes, but it’s worth a try. protect them from other types of insects. Planting herbs and certain plants in your yard and garden is a great way to beautify your area while repelling pesky mosquitoes. in on body temperature — and it automatically rises when you exercise. Avoid salty foods and those containing high amounts of potassium. Don’t wear dark clothing when in a mosquito-infested area. Don’t wear lotions or perfumed products that contain floral fragrances. Just because a product is natural doesn’t mean it’s safe, so be sure that you know if you’re sensitive to it before using. The leaves of the following must be crushed to release the aroma. Otherwise mosquitoes can’t smell them. and will grow in USDA Zones 5-10. * Marigold is a sun-loving annual used by organic gardeners to keep aphids away. effectiveness. But, since it’s attractive, it can’t hurt. * Agastache Cana is another form of mosquito plant. leaves and rub on your skin and clothing to enhance the effect. Another plant, ageratum, contains coumarin. But don’t rub it on your skin. Look out for the specific qualities of herbs that repel insects. number of commercially available products that repel pests. Wormwood, southernwood [Artemisia sp.] - lovely silvery, bushy appearance that repels moths, intestinal worm, slugs, and flies. Rue [Ruta graveolens] - repels cats. It is also good for controlling fleas and Japanese beetle. Tanacetum genus (pyrethrum, tansy, feverfew) - repels moths, flies, ants, mice, mosquitoes, cockroaches, mites and bedbugs. Tansy is a strong herb suitable for growing around doorways to act as an insect deterrence. Pyrethrum is great made into a spray. Feverfew (pictured) is a good insect repellent and is also used for treating insect bites. The fact that feverfew is usually pest-free says something positive about its pest abilities. Lavender - repels flies, silverfish fleas; add to sachets and hang in the wardrobe. Santolina (Cotton Lavender) has the strongest insect repellent properties and can be mixed with English lavender in sachets. Mint - repels flies, fleas, mice, rats and ants. Mountain mint rubbed on pants can deter chiggers and ticks. An endangered mint plant from Florida, Disceranda frutescens, has been found to be a very powerful insect repellent; try and grow some! Catnip - mosquitoes. It is even said that the essential oil in catnip, nepetalactone, is 10 times more effective than DEET! Thyme - deters insect pests and also helps with preventing musty odours; use in sachets, both flowers and leaves. 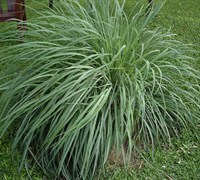 Lemongrass - contains citronella - run the long grassy leaves and stalk on the skin to repel mosquitoes. Basil - fly and mosquito repellent; grow near outdoor eating areas. Sage - deters a variety of insects. Hang dried bundles in the house and at doorways. punch to the work being done by your citronella candles! Harvest, dry and use in sachets for drawers, wardrobes, storage boxes etc. Harvest, dry and use hanging from curtain rods in the laundry, kitchen area or from clothes hanging rods. Make water-based sprays - follow a suitable recipe. 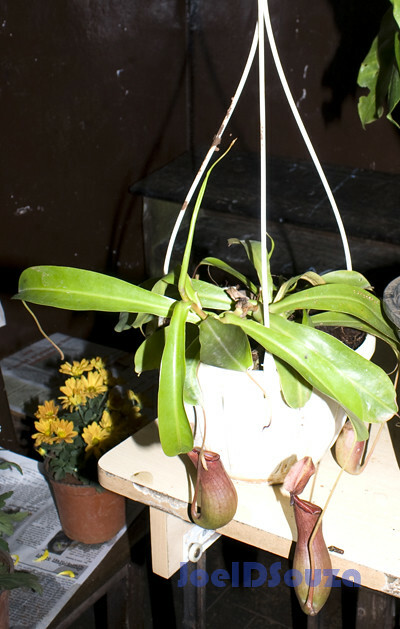 “pitcher” plant…. the flower resembles a pitcher.